Why do you get up in the morning? Is your life filled with purpose? What does a purpose-filled life look like and mean, actually? If you ask a hundred people, you’ll probably get a hundred different answers. However, most people would probably agree that a life of purpose is a life worth living. Today we explore the fifth lesson from centenarians living in the Blue Zones, unique communities that have common elements of diet, lifestyle and outlook on life that have led not only to an amazing number of years lived, but also to a better quality of life. In preparation for our upcoming Healthy Lifestyle Challenge, I’m reposting (this time with recipes) all nine lessons from the Blue Zones. The lessons are simple, yet powerful, and can help put anyone on the path to a healthier and happier life. Centenarians living in Nicoya call it plan de vida and Okinawans call it ikigai. It’s a strong sense of purpose that translates to “why I wake up in the morning.” Research studies have shown a strong correlation between having a sense of purpose and longevity. People who express a clear goal in life—something to get up for in the morning—live longer than those who do not. This sense of purpose may act as a buffer against stress and help reduce chances of suffering from Alzheimer’s disease, arthritis, and stroke. Purpose can come from a job, a hobby, seeing children or grandchildren grow up, or being the primary caretaker of a pet. A new activity can also give one a sense of purpose. Learning a musical instrument or a new language provides the added bonus of helping to keep your brain active, engaged and sharp. A portion of a life with a strong sense of purpose should be devoted to something that inspires you, energizes you, and pulls your forward. A sense of purpose can come from something that responds to your unique talent or touch and makes a difference in your life and/or the world around you. A purposeful life would naturally bring more meaning, love, laughter, wonder and adventure to your days and, at the end of your journey, you would look back on a life of significance, rather than regret. That strong sense of purpose is not just something we experience, it’s something we create. If you currently don’t have a sense of purpose, how about starting to create yours by answering the following question in a single, memorable sentence: Why do you get up in the morning? Craft a personal mission statement. Consider what you’re passionate about, how you enjoy using your talents, and what is truly important to you. Find someone—a friend, a family member, a spouse, a colleague—to whom you can communicate your life purpose, along with a plan for realizing it. Be sure that person can help you honestly assess your plan and successes. Learn something new. Take up a new instrument or learn a new language. Both activities are among the most powerful things you can do to preserve your mental sharpness. Next post: Lesson number six from Blue Zones centenarians. Won’t you join me? Until then, I wish you abundance and a beautiful life filled with a strong sense of purpose, love, and happiness. Preheat the oven to 350F. Put the potatoes on a baking sheet and bake in the oven until tender, about 1 hour. Remove from oven and let cool until warm enough to handle, 10 to 15 minutes. Peel and discard the skin. Put the potatoes in the bowl of a food processor fitted with the steel blade. Meanwhile, pour the milk into a 2-quart pot, add the bay leaves and thyme and set it over low-medium heat. Bring to a gentle simmer and cook for about 5 minutes. Remove from heat. Discard the bay leaves. Pour the mixture over the potatoes in the processor (of high speed blender like a Vitamix) and add the hazelnut oil. Purée the potato mixture until smooth. Season with salt and a few grinds of pepper, or to taste. Keep covered and warm until ready to serve. * I made three variations using a different type of potato each time. 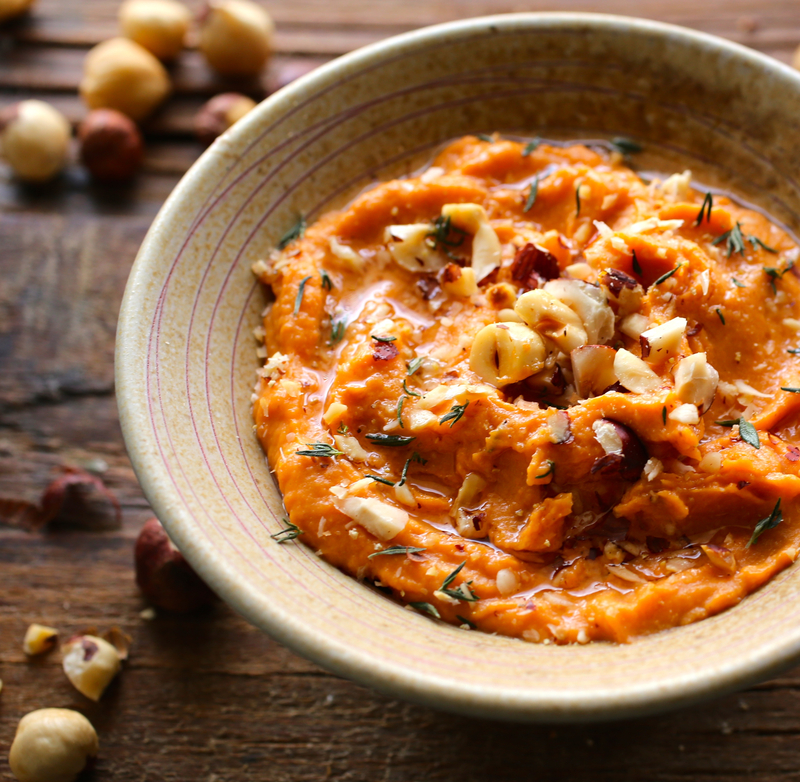 I used Yukon Gold, Sweet Potatoes and Japanese Sweet Potatoes. I had several taste testers and each of them had different favorites of the three. So I’m presenting them all to you for you to try and try and decide which is your favorite. 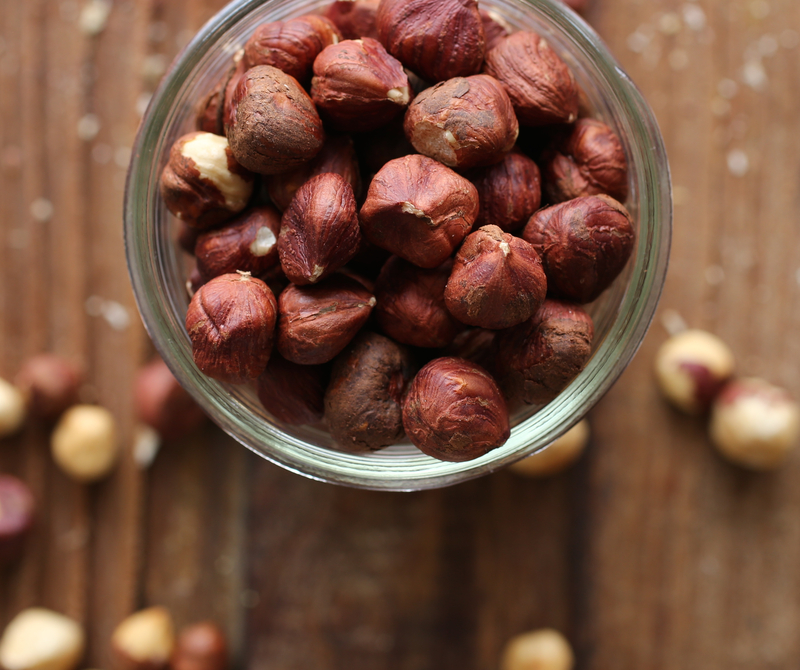 After hazelnuts have soaked overnight, rinse and drain well. Place them in a high-speed blender (I use a Vitamix) with about 4 cups of fresh water and blend a few minutes. Add more water if necessary. Using a nut milk bag or very fine cheesecloth. Strain milk and pour into an airtight container. Notes: Your milk should keep in the refrigerator for 2-3 days. 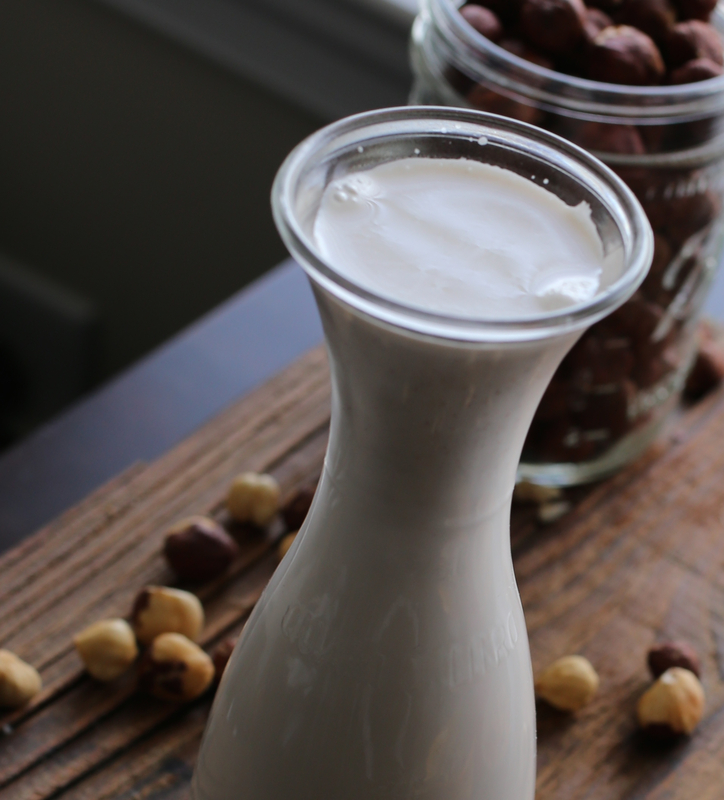 For other uses, you can flavor and sweeten your fresh hazelnut milk with vanilla, cinnamon, dates, etc. Awesome post! 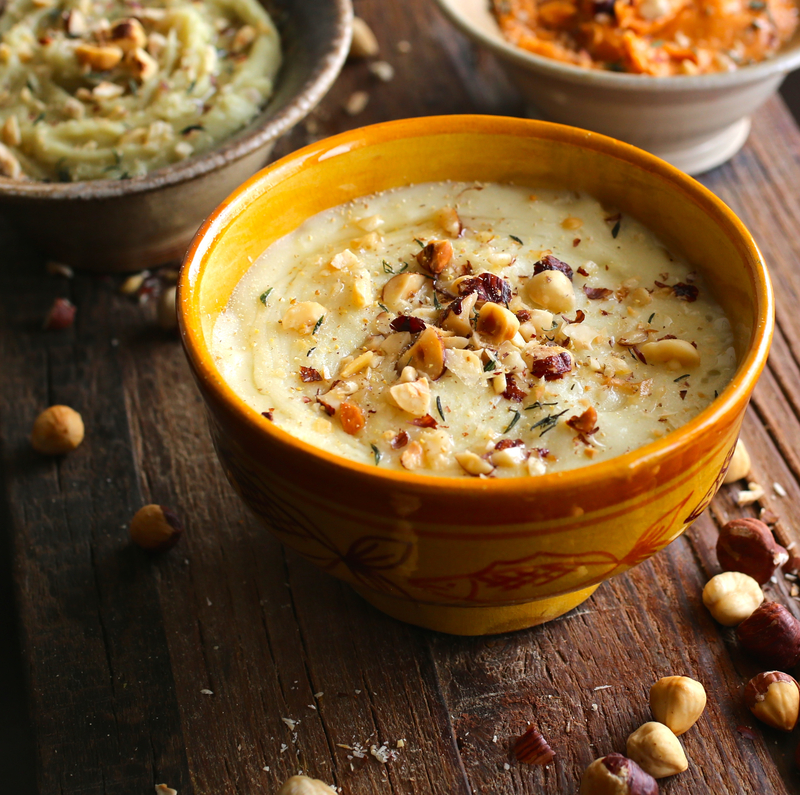 Great idea to incorporate the hazelnuts into the mashed potatoes! Can’t wait to try! Thank you so much!!! So glad you these mashed potatoes. Please try it and let me know how you like it! Will do! The challenge at the beginning of your post was very inspiring as well! Keep up the good work! Awesome! Thanks! I’m actually writing up another post on an upcoming Health Challenge. I hope you can join! Should be challenging, but hopefully inspiring too. I really need a health restart so I am definitely interested! I need one too, seriously!!!! I hope to post more details of the Challenge early next week! Bonjour Linda! Je suis ravie que tu aime cette recette et l’article! Merci!! 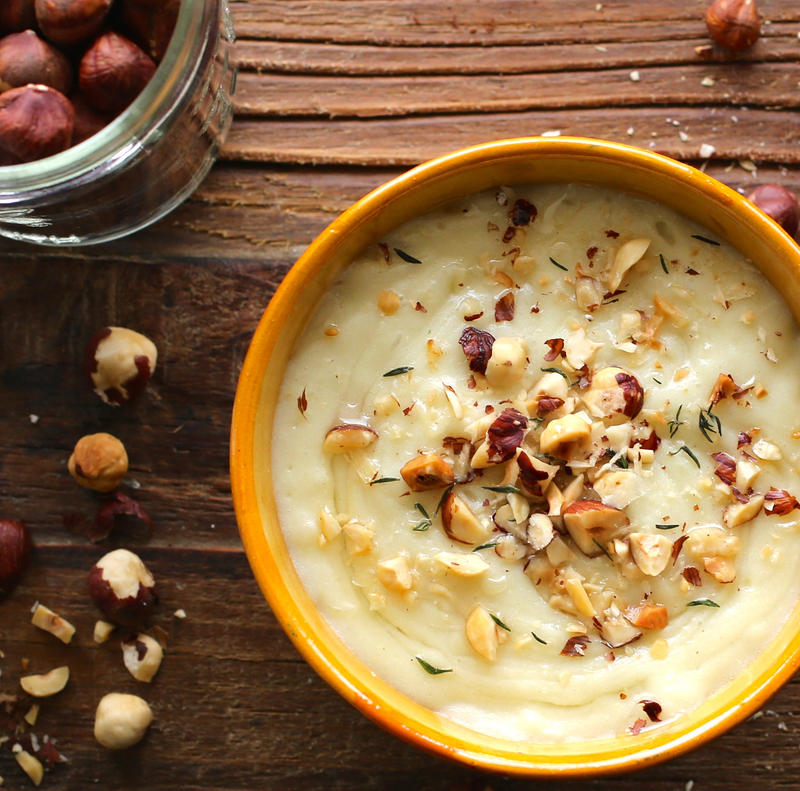 I love the idea of adding the flavour of hazelnut to mashed potato. This is definitely a recipe I need to try! So happy you like this idea! We loved the combination.Thanks so much for letting me know your thoughts about it! I hope you try and like it! Thank you Sonal! So glad to know what you think about it. Thanks! Where do you find Japanese Sweet Potatoes? And how are they different from the regular Sweet Potatoes? I bought mine from Whole Foods. They’re a little red/purplish on the outside and light yellow on the inside. They’re a bit more dense and starchier than regular sweet potatoes, and their flesh is a little softer. Their flavor is a little more mild. We like to eat both varieties.